Patch V.1.11 is planned to release on Dec. 14. Tune into the Survive the Holiday's Dev Stream on Dec. 13 @ 4:00pm - 5:00pm EST! 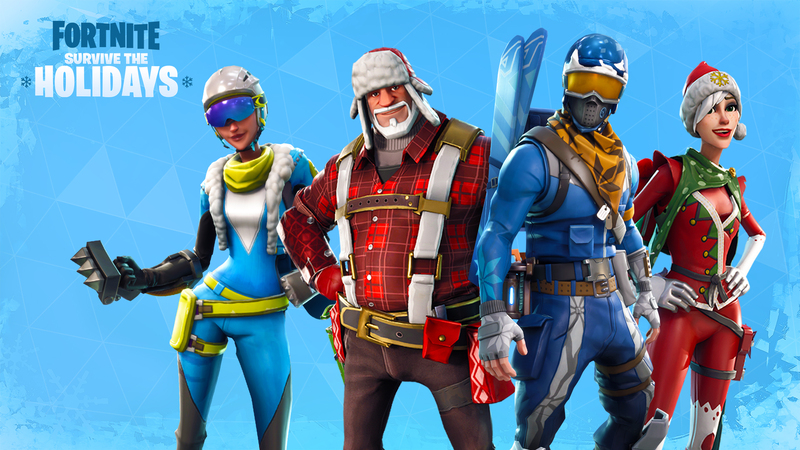 We have a snow-packed update for you in our V.1.11 patch, including the beginning of Season 2 for Fortnite Battle Royale and the new Battle Pass! 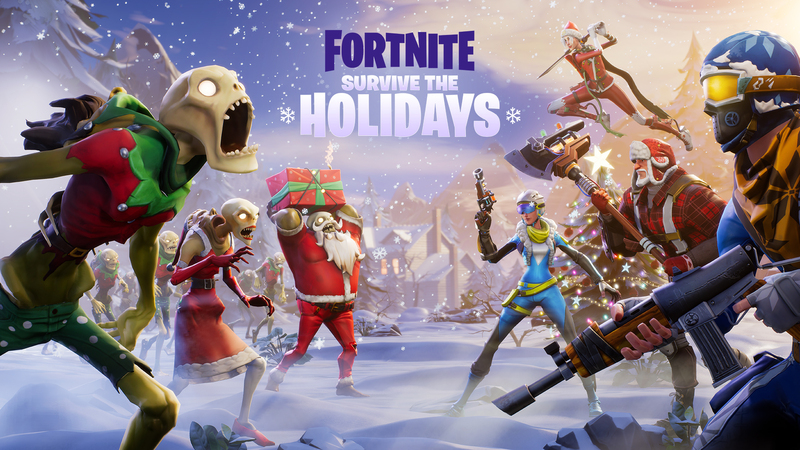 In addition, we have “The Fortnite Guide to Holiday Survival” Winter Event for Save the World, featuring global inventory, a new questline, holiday heroes, weapons, and an event currency store (hype!). The TL;DR is … buy the Battle Pass to get cosmetic loot now. Play to level up your Battle Pass, unlocking 65+ rewards by the end of the season. (It typically takes 75 to 150 hours of play to get everything.) Season 2 begins on Dec. 14 and ends on Feb 20. Got questions? Ask them here! A new store with items you can purchase using in-game currency! Play any mission and earn Seasonal Gold. Use this currency to snag some seasonal items or see what the weekly section has to offer. Items rotate weekly. Access Your Inventory from Everywhere! Manage all your storage with our new global inventory. You can now access your inventory from the menu without having to load into a mission! Pssst...Save the World global crafting coming soon! Season 2 of Battle Royale begins Dec. 14! Season store is replaced with the Season 2 Battle Pass. The update includes the limited-time Snowball Grenade Launcher, a festive Battle Bus, and other gifts waiting for you around the island. 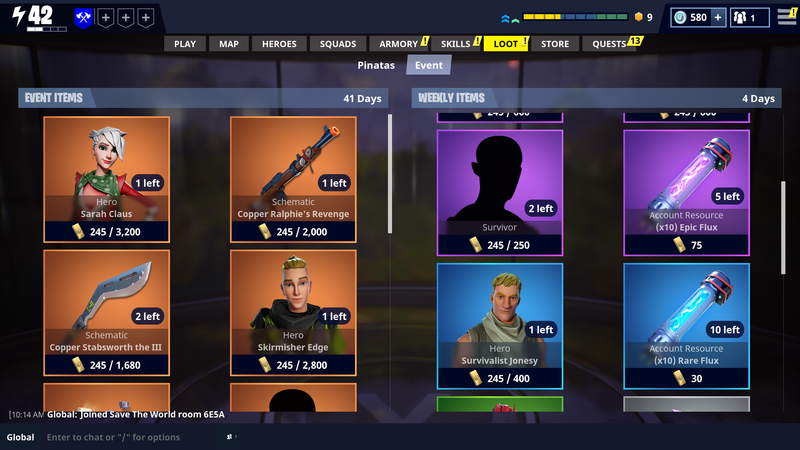 Emotes and emoticons can be earned as rewards via the Battle Pass or can be purchased in the Shop. Equip up to 6 and trigger them in game with B (keyboard) or Down on the D-Pad (controller). Compete in solos or with friends to complete the two new Daily Quests. Anyone already on these quests will have their progress reset. Added support for 21:9 displays and any other ultrawide resolutions. Added animations for sliding down cliff sides. Added animations to turn head to reticle while sprinting diagonally. The “Combat Pro” controller configuration will now be the default configuration for new players. No change has been made to existing users. Soccer and Basketballs now have smoother movement. How long can you keep the ball in play? Fixed an issue that caused actual damage dealt to not match up with damage numbers on screen. Floating damage numbers would sometimes be one digit higher than the actual damage dealt due to rounding issues. Chests no longer appear unopened at a distance when they have already been looted. Fixed an issue that prevented players from picking up items that overlapped looted chests and ammo crates. Build mode blueprints are now hidden after using a Launch Pad and while DBNO. Fixed an issue that prevented players from taking fall damage if they had 1HP remaining. Fixed a broken animation that occurred while switching between certain equipped items. Fixed the Renegade Raider outfit’s head so it doesn't clip through the helmet anymore. Character models now animate properly when rotating in place. Fixed an issue that allowed players to "search" items like bushes and furniture, causing them to wiggle and play an audio cue. These types of items are now only searchable in the Save the World co-op mode. Reduced aim assist prioritizing DBNO players. When throwing grenades, a trajectory will now be visible that previews the arc the grenade will follow. Renamed some weapons for consistency. “Assault Rifle (Scope)” is now “Assault Rifle with Scope”. “Assault Rifle (Burst)” is now “Burst Assault Rifle”. “Submachine Gun (Suppressor)” is now “Suppressed Submachine Gun”. Legendary assault rifle drop rate decreased by 25% in floor loot and chests. Drop rate from Supply Drops will be unchanged. Reduced pump shotgun shot queueing time. This will reduce the chance that players will misfire the weapon. Updated the icon for the standard grenade. Removed controller aim assist slow while scoped. This will make it easier to use sniper rifles with a controller. Pump Shotgun now correctly queues shots the same as all other weapons, reducing chances of an accidental extra shot being fired. Sniper rifle projectiles no longer pass through other players under non-ideal network conditions. Hit impacts from a sniper rifle play on the correct location of the enemy player now. Fixed an issue that allowed bullets to pass through player built pyramid structures. Fixed issue causing smoke beams to not play when weapons were fired. Improved the game mode selection flow and UI. This should make it much easier to select a game mode with a controller. When opening your inventory, the mouse cursor will now always appear in the center of the screen on PC and Mac. The Code of Conduct is now displayed directly in the game UI, rather than opening an external page. The Inspect button for Battle Royale Daily Challenges has been moved to the bottom bar. Fixed an issue causing the "Push to Talk" binding from being removed when selecting the "Reset to Default" button in the Save the World settings. Using the "Report Player" option in Duo or Squad will now auto-fill with the name of the player that eliminated you instead of your teammates name. Fixed some missing localized text in various languages. Fixed an issue that prevented the "Daily Challenges" scroll bar from working with a controller. Improved visibility of the number of players remaining on each team in 50v50 mode. Fixed an issue that caused some options in the settings menu to disappear when the player was eliminated while the setting menu was open. Fixed an issue that caused player's health and shield bars to appear empty on the victory screen. Improved the audio cue that plays when hitting the generators found in the world. Previously, it was playing similar audio to the ceiling/wall traps. Clap audio is now adjusted by the SFX slider in the audio settings. Fixed an issue that caused players to hear bullet whiz-by audio that was not heard by the person they were spectating. Dance emote music no longer continues to play for others when the dance is cancelled. Various optimizations to interactive objects such as doors to improve overall frame rate. Minor frame rate improvements by optimizing weapons. 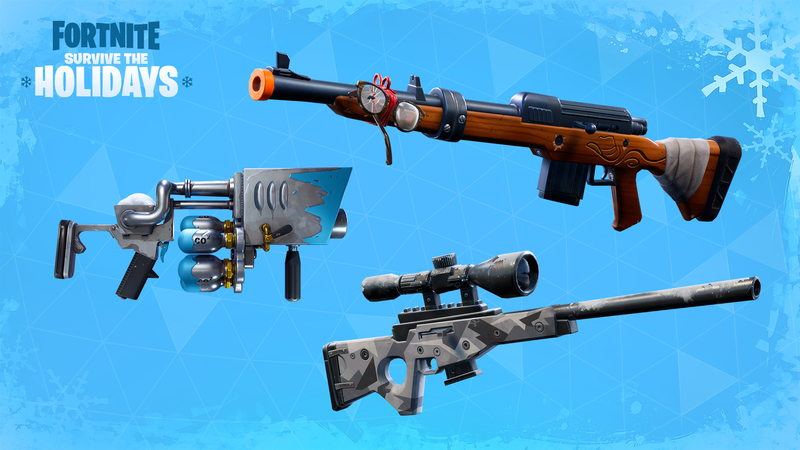 Eliminated many hitches which could happen the first time you encountered a player’s skin or weapon in a match. Fixed an issue with particles that caused hitching as the time of day changes. Improved server performance by optimizing how physics are updated. Fixed performance issues with ladybug ambient particles in the world. Fixed an issue with the storm safe zones that could cause poor server performance. Greatly reduced CPU usage of in-game party and chat systems. "View Match Results" is now bound to V by default. Fixed an issue causing the total XP earned on the Match Stats screen to be inaccurate. Traps now add to the "assists" and "damage dealt" stats. Fixed an issue that incorrectly gave an assist credit to a player for simply hitting another player with a pickaxe before being eliminated. "Total Headshots" is now equal to the number of headshots achieved instead of the amount of headshot damage that the player dealt. Fixed an issue that caused the "Damage Taken" stat to be less than 100 after being eliminated. Shots fired during the warm-up zone no longer affect the player's "Accuracy" stat. Fixed an issue that incorrectly awarded the "First Kill" XP bonus to every player that got an elimination during the match. Projectile weapons will now add to the "Accuracy", "Hits", and "Critical Hits" stats. Added the ability to invite players to your party through Discord on PC. Added full voice chat support to Mac. Enabled Twitch login support for Battle Royale. Fixed an issue preventing players from connecting to the "Friends Only" leaderboards. Fixed a crash related to the voice chat feature. 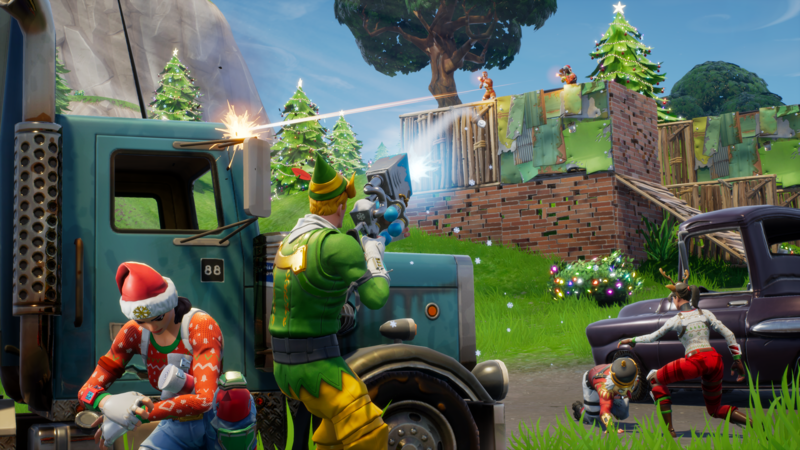 The Fortnite Guide to Holiday Survival is here! Help Ray bring the holiday spirit to everyone in the husk-ridden world in this new event questline. Earn an avalanche of Snowflake Tickets by participating in the event. Players will receive Mission Alert updates for the duration of the holiday event! Be on the lookout for secret holiday-themed activities! With the end of the Mutant Storms event, every 1,000 unspent Storm Tickets will be converted to a storm llama that will be available in their loot tab. All other unspent tickets will be lost after this event is over. These are super-tough versions of the Husk, Husky, and Smasher that have up to four randomized gameplay modifiers attached. Mini-Bosses can appear in many different mission types, indicated by new Mini-Boss Mission Alerts that appear on the theater map. These new Mission Alerts reward event tickets and up to 10 can be completed each day. Note that while Mutant Storms are also present on the map to provide evolution materials, these do not reward event tickets. Mini-Bosses will also appear in the updated Survival mode, detailed below. There is a new repeatable quest that gives Seasonal Gold each time you manage to take out a Mini-Boss in a successful mission. Look for this feature to expand in the future! New Winter survival map, with festive trees, snow and a mountain vista. Players now have the ability to skip the day by voting. There are now two versions of Survival: 3-day and 7-day. No voting to extend, just show up prepared to fight! Vindertech upgraded the traditional generators. They are more resilient but cannot be fixed in the field. Generator placement spots differ from game to game. Expect a Mini-Boss to drop in the fight on days 3 and 7. Adjusted and rebalanced difficulty, resourcing and rewards. Every day, the first three missions grant bonus loot. Every day your first mission win grants bonus loot. Snowflake Tickets can continue to be earned during Survival Mode after the Mission Alert quota has been reached but at a much smaller rate. Grab yourself a stocking stuffer! Holiday Survival Banners can be earned by completing Survive the Storm event quests. Four new hero builds are in town for the holiday event. Sarah Claus: Alchemist - Gradually regenerates health through melee combat while wearing down enemies with corrosion. Blitzen BASE Kyle: Warden - Heals himself during melee combat, has Hardware weapon boosts, and has a BASE that regenerates the health of allies who stand inside it. Snow Stalker Jonesy: Demolisher - Specializes in fighting crowds of enemies with explosive shells and grenades that regenerate more quickly in combat. Fragment Flurry Jess: Reclaimer - Fragment specialist with an energy beam equipped TEDDY who can charge their abilities by defeating enemies in combat. Legendary Sarah Claus is available in the Event Store. Epic Jonesy, Epic Jess, and Legendary Kyle are available via quests. Ralphie’s Revenge - A low-damage sniper rifle with a MASSIVE headshot multiplier. Remember to wear eye protection! Available in the Event Store. Frostbite - A wintery sniper rifle that deals Water damage and gets a damage bonus after headshot streaks. Earned by completing Survival mission quests. Snowball Launcher - Fires snowballs that damage and snare groups of enemies. In addition to that, we’re also introducing the Vacuum Tube Weapon Set! These electrified weapons use energy cell ammo and deal Nature damage. Sniper Rifle - Fires a long-range high-damage continuous beam of lightning. Auto Pistol - A shorter-range lightning beam pistol. Revolver - Fires powerful zaps of lightning that damage and stun foes. Assault Rifle - A semi-auto rifle with a good amount of impact that stuns enemies. Shotgun - Discharges 3 quick short-range bursts of lightning. Axe, Sword, and Spear - Heavy electrified melee weapons that stun enemies rather than knocking them back. Ball Lightning Launcher - Fires 3 balls of lightning that damage and stun enemies in a large radius. 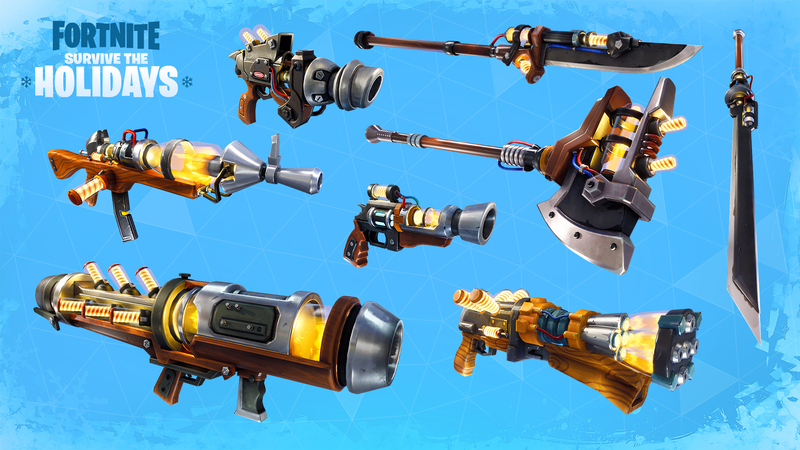 All of these weapons are available in the Holiday Survival Llama. Hero upgrading allows you to upgrade your Hero cards to higher rarities! Players may notice an outfit change when upgrading Hero rarities. A new type of resource called “Flux” is used to upgrade the rarity of heroes. It can be purchased from the Event Store. The Event section has items available for the current major event! The Weekly section has new items to check out every week. These items can be purchased with new currencies: Seasonal Gold and Daily Coins. Seasonal Gold can be earned by playing any mission. Drop rate scales with difficulty. Access Your Backpack and Storage before loading into the world! Players can now view and interact with their Backpack and Storm Shield Storage via the Armory screen before entering the world! Use the Backpack screen to equip weapons and recycle world items. Use the Storage screen to transfer items between backpack and storage. No more guessing where those quest rewards landed - new item notifications will lead you to them. Crafting in the frontend backpack is coming soon! You can now complete up to four Mutant Storms per day for rewards. The Collection Book now offers rewards up to level 350. Raider Nomad - A new shotgun focused soldier hero. Get to level 100 in the collection book to unlock him. Outlanders now start with the ability to hold one Charge Fragment, down from two. However, both TEDDY and Shock Tower now increase this Fragment capacity by one. As a result Outlanders with one Fragment ability have the same capacity as before (two) while Outlanders with both TEDDY and Shock Tower can carry one extra (three). The 'Unlock 2-Star Constructor Evolution' node has now become the 'Unlock 2-Star Constructor Evolution & Constructor Promotions' node. If you already owned one of these nodes, then you have also been granted the ability to promote that class of hero. Added Tutorial Quest for upgrading a Hero’s rarity. 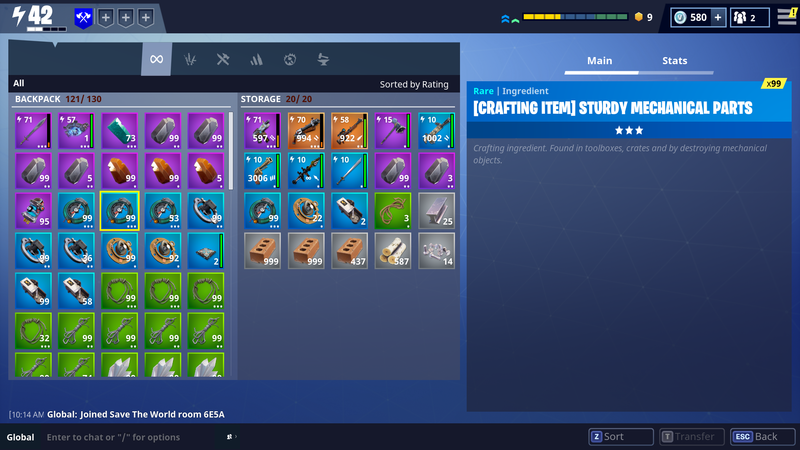 Granted after the Supply Run Quest in Stonewood has been completed. Rucksack soldier perk now grants two extra Frag Grenades, down from three. 'Adjustable Choke' support bonus now properly modifies critical rate with shotguns. Fixed an issue that was causing the Goin’ Commando ability to scale with both Tech and Offense. It now only scales with Tech. Quest Items now drop from props or enemies no matter who destroys them. Storm Chest duration timer now starts when the first enemy spawns, this is fairer as it sometimes takes a couple of seconds to spawn enemies. Drone Salvage mission now gives 15 more seconds to reach the site and build defenses before it crashes. Drone Salvage mission now gives tiered mechanical crafting ingredients in addition to its previous rewards. The "Clear!" quest will now update appropriately once the Med-bot has been completed. Added missing daily discovery quest updates to some parks and parking lots. Fixed an issue where survivors wouldn’t spawn on Building the Relay missions. Fixed an issue where The Storm Chest wouldn’t complete correctly when only one Mist Monster spawned and was eliminated. Characters in pregame and postgame lobbies now have a floor to stand on. No more floating! New Hero View Screen where you can spin your selected hero 360 degrees. Changed the text on the multi-Upgrade-Llama purchase options to clarify that the Llamas do not have a higher chance to upgrade than a normal Upgrade Llama does. Stat comparisons have been updated to display Build Cost reductions as a positive rather than a negative. When a crafting action fails, the crafting queue is cleared and the ingredient list is immediately refreshed to show refunded resources. Fixed an issue where the remaining amount of llamas wasn't being shown to the player on the loot tab screen. The Proximity Mine node description now shows “explosion radius” instead of “detonation radius”. Fixed rift icons not showing up on the main map until they appeared on the mini-map. Reduced auto-scrolling of the schematics list during crafting. Fixed the Goin' Commando weapon showing up in inventory during use. Transformer zap sound updated to use new electrical sounds. Removed unnecessary collision work on the server to improve server performance. Reduced number of objects updating each frame to improve performance. Experiencing issues updating, logging in or crashing in Fortnite? Reach out to player support here.